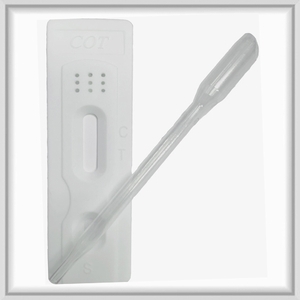 Our tobacco drug test determines whether COT is present in urine. Detectable up to 4 days after a person�s last cigarette. Have donor provide urine sample and let stand until it's room temperature. Open the foil pouch and remove the test device & eye dropper. Negative: One colored line appears in the control (C) region, and another colored line in the test (T) region. The color intensity of the test line may be weaker or stronger than that of the control line, but regardless of the intensity, the result is negative. Compared to dip panel tests, cassettes have much less opportunity for procedure mistakes because dip panel/strip tests could be under or over dipped and provide an incorrect test result. When you purchase our cassette, which includes a pipette (dropper), you�re able to deliver the exact amount of urine needed for accurate results.